It didnt occur to me until a couple of days ago but, count me out. I thought people meant Godbomber was a separate purchase. It is isn't? I thought there were 3 different releases. First the cab, then the trailer armour then God Bomber. I'd only buy it together and not $300+. Minus Godbomber. Yep, not a lot of people would get ginrai seperately as a cab and the trailer. Makes me wish PC would’ve made a true super ginrai. So I'm no expert on any of the Japanese only series or anything that came after Headmasters/ Target Masters, but shouldn't the "naked" Ginrai look almost exactly like Prime? aside from a slightly different truck scheme and red/blue color differences, yes. he had a weird truck transformation. True, msrp might be a little higher. Whatever FansHobby's was at retail would be the target. See that's still not fair though. The core Optimus figure from Powerbaser was more chug-like than KFC's. When ibot says this version is being made with better materials and paint and such, and when you look at the articulation on their Optimus, it has to be more. It just shouldn't be nearly twice as much. Also, I replied in the PMOp thread instead of the Menasor thread cuz we were getting off topic. So glad to be almost done collecting TFs so the absurd price jumps foreshadowed and all too willingly accepted by some here will have minimal impact on me. They will find out through weak preorders but we already know they scour these forums even if they don't post. It's very important that we always let them know when something is not going to work and especially price. I think too much weight is given to the China market but they need to know that the market isn't as elastic and inflationary as they think it is. I remember all of the ridiculous arguments I got into on here about price with people getting sidetracked with the cost on some little accessory when these companies set these prices where they want them and where they think the market will absorb. iBot needs to consider the dichotomy of Apollyon and Simba and how that figure was really quite good but got belated love because of their reputation. They are fighting the same battle now with their combiner that is going to be quite good. Killing it on God Ginrai, Menasor, Overlord, and Deathsaurus can really push their reputation and their sales if they don't blow it on price. They can be expensive but going ridiculous can be just as damaging as bad qc. They had this leaders strategy from the beginning that they put on hold. No time to blow it twice when they have the means to knock it out of the park. I like the look of the base 'bot, but the super forms look oddly disproportionate to me. There's some Johnny Longtorso going on there. I'm still very torn on this. The price just isn't worth it to me. I also think Power Baser might scale better with MP Star/Victory Saber (off the top of my head - I need to go back and check to be sure), but I have a lot of issues with Power Baser, which KFC may or may not address (though the overly-long Ginrai cab KFC has here isn't really doing it any favours either). I feel like FansHobby always get so close to perfection but always make a few odd choices that just throw their figures off from being actually perfect, and it drives me nuts because I want to like their products, but they always feel like a "good enough" effort, and that's not good enough for me. But I suppose the question is if KFC will do it better, because I feel like a lot of their stuff also falls into the same category (especially since neither KFC nor XTB seem have yet to figure out how to do good spacing on ratchet joints, which isn't the end of the world but it is annoying). I probably won't ever be done personally, and so the price hikes are scaring me a lot more. Even the Hasbro stuff is now ridiculously overpriced over here, up from the already-high prices (and we aren't apparently getting Siege until the end of March either). Agreed, but I've heard FansHobby's materials are already pretty top shelf, so one has to truly wonder what "better materials" means. It better not just mean they're going to put more die-cast in the thing. That's unnecessary. The illusion that heft = value is so silly, because it has never been inherently true of all products. So they haven't backed down from that insane price? Oh well, I didn't need a pmop that badly anyway. Might get Fans Hobby's version but I'm not sure I'll even bother with that. Or maybe they have? Just checked ShowZ and they've got Optimus listed at $135 and the trailer at $172 for a total of $307 for pmop including shipping. It's still too much (I'd need him to be no more than $250 before I'd consider getting him) but $40 less is nothing to sneeze at. Oh and godbomber is $178 if that's something you're into: $485 total instead of $550. I'm sure toabao would be cheaper but I can't be bothered to go to that much trouble. God dammit why does this have to be so expensive? 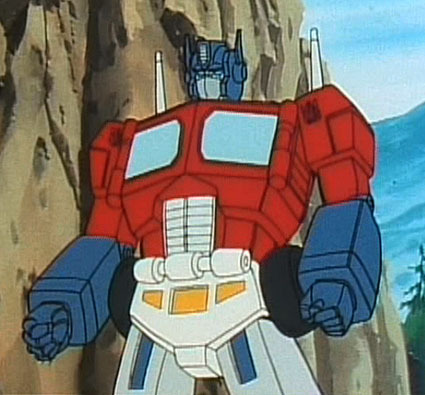 Powermaster Optimus Prime is my favorite Prime. I just wish someone would do a real Earth mode Cab Over Double Trailer. That would be dope as heck.